It is absolutely true that Holden is a wonderful and reliable brand popular for producing the best makes. This is the reason it is famous as Australia’s best-selling brand. However, every vehicle has a limited lifespan. Even if it is an efficient Holden make, it will eventually need frequent repairs or stop working well. And, it is definitely not practical to keep a useless or scrap vehicle in your garage. Not only it will take a valuable space but also make your place look filthy and unhygienic. Get help from your local Holden Wreckers Perth crew today. So, once you decide to let your baby go to a place where it really belongs. Make sure to contact none other than Perth Auto Wreckers – WA’s favourite scrap car yards. If you live anywhere in Western Australia, we will love to buy your old Holden vehicle in any condition. Since, Holden has been Australia’s local brand, we love to pay even more for the Holden vehicles to save the glory of local brands. How to get the best price for your Holden? 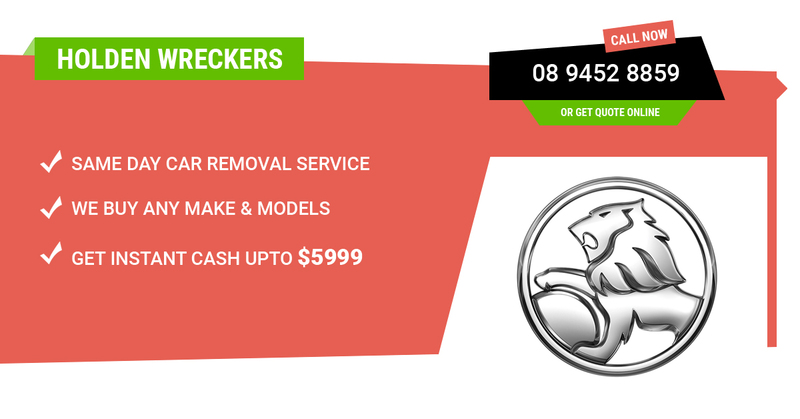 Being the leading Holden wreckers in Perth, we provide effective ways to resolve the troubles of junk auto owners. Our auto removal solutions are not only smart but also beneficial. As we can help you free up a good amount of space in your home once you scrap your old vehicle with us. Additionally, we will pay you a fair remuneration depending on the condition of Holden in which you offer your automobile. We are truly dedicated to offer risk free and simple Holden removal facility from the location of the seller. Our crew have been working in this industry for more than 25 years. During all these years we have gained much knowledge and skills to deal with all kinds of unwanted vehicles. Due to this we are able to reap benefits from junk cars, vans, Utes, trucks, SUVs as well as 4WDs. The unwanted automobiles provide us recyclable steel and metal components. In the similar way they offer a large variety of parts which can be reused after undergoing a recycling process. When you decide to remove your old or unwanted Holden. You can certainly find a number of cash for car services. Most of them claim to pay the top-notch price for scrap and damaged automobiles. However, they will surprise you with additional fees or hidden costs at the time of removing your vehicle. Contrastingly, we pick up the old and junk automobiles for free. There are no additional expenses and hidden fees related to the pickup process. As we believe in offering a removal process that is both stress-free and inexpensive. In the end, we will even pay you the best price guaranteed by our experts. Whether your Holden is wrecked, second hand, old, totalled, unwanted, unregistered or simply useless. We give full guarantee to pay you maximum dollars for it [If we fail to offer you the best price in the town, then we are more than happy to do the price matches]. The final price can go up to $9,999 and vary according to the current condition of your wheels. We assure you that none of our competitors can beat our cash quotes. However, you are free to tell us if you obtain a higher cash offer from any other company. If you need to fix or repair your used vehicle and you are eyeing for inexpensive options. Make sure to have a look at our huge inventory of parts and accessories for Holden vehicles. We have got an extensive variety of second hand components for sale. They are priced at the most affordable rates so you can buy your desirable part within a reasonable budget. Just get in touch with our kind and helpful team today. You are free to give us a call at: (08) 9452 8859. Otherwise, fill out our online appraisal form which is available on our homepage. We will be delighted to get back to you ASAP.